The enhanced edition of Baldur's Gate II just came out on iPad, and the folks who made it want to convince you that it's worth your time and money. 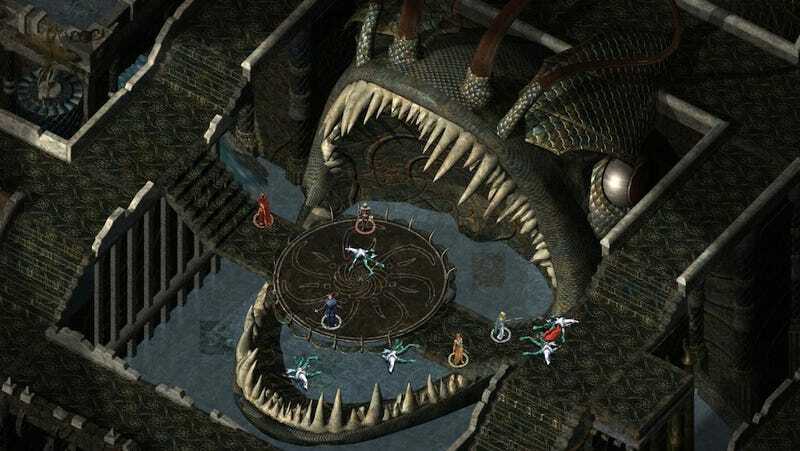 Baldur's Gate II, of course, is worth your time and money. It's one of the greatest RPGs ever made. The more pressing question is: which version should you get—the cheaper original version on GOG or the pricier enhanced version on iPad and PC? I haven't played enough of the Enhanced Edition to be able to give you a definitive recommendation either way, but in the interest of telling you more about it, I sent the team some questions about what they've done and why readers should care. Here's my Q&A with Trent Oster, creative director on Baldur's Gate II: Enhanced Edition. Schreier: BG2 is obviously known as one of the greatest games of all time, but for over a decade now, people have been playing it on PC, with lots and lots of cool - and, perhaps just as importantly, *free* - mods. What would you say to Kotaku readers who want to know why they should pay for the EE? Oster: With the Enhanced Editions we set out to create the best possible version of Baldur's Gate you could find. We've made massive improvements in everything from true-type-font support for crystal clear text to repainting every pixel of the UI at over four times the resolution of the original game. We optimized game areas to load instantly, eliminating thirty-second-plus load times for areas. We brought in the original source-rendered area art for BGII, removing a lot of banding and artifacting. We fixed a huge number of bugs in the original game, including inconsistencies such as trolls who did not die when struck by a fire-based attack. We added a true widescreen support mode which allowed the user to play the game at massive resolutions while keeping the clear fonts. In short, we've put a ton of work into the game and I encourage people to have a look back at the original to see how far we've come. Schreier: It seems like adapting both BG and BG2 for touchscreens was quite a challenge - can you talk a bit about what that process was like? How did you manage to get these games running well on an interface they weren't designed for? Are you happy with the results? Oster: Adapting a game that is so hard-coded to be run on the Windows platform with a keyboard and two-button mouse was a massive challenge. The first stage of the operation was the cutting. We went in and cut all the sound, input and video out of the game and re-built those systems to be cross-platform. In retrospect, we stopped too soon, as we should have cut off all the file IO and other major systems as well. Once we had the basic game up and functioning on the iPad we started implementing our control scheme. We initially focused on having a one-to-one relationship between PC and iOS controls, but very quickly it became obvious that approach would not work. While it may seem that on PC you spend most of your time clicking on the ground to move your party, in fact you spend most of your time navigating the screen. We created a hierarchy of actions based on frequency and importance to the game, additionally factoring in time pressure while using those input methods. This hierarchy led us to put screen scrolling at the top, with a touch-drag move handling the screen scrolling. A straight touch on empty terrain is "move here," a touch on a door became open/unlock, a touch on a neutral character was assigned to conversation and a touch on a hostile character was given attack. We tried a number of different interface ideas before settling on those basics, and the end results are pretty slick. Schreier: Lots of people have been complaining about bugs in this version of the game - is that something you guys are aware of? I believe I saw one Joystiq editor tweet that her app crashed as soon as she rolled a character. What is the plan for fixing this stuff? Oster: I'd have to disagree regarding the number of bugs we've seen. In many cases we've worked with people to solve their issues and it mostly comes down to the question "when did you last re-boot your iPad?" Baldur's Gate II was well over 3.6 GB in size when we started. We've done some hard work to bring the size down, but it still makes some strong demands on the hardware. If you've had your iPad running for a few months it will have some memory fragmentation and that can cause issues with any large game. If you check out most larger video games on the iPad they recommend a reboot before or after the install, just to ensure a fragmentation-free space to run the game in. With that said, there are some smaller bugs. With an epic game of over 100 hours of gameplay some issues sneak through. With regards to our plans, they are quite simple: fix bugs as we find them, add new features as we think them up and update our fans to new versions of the game. Schreier: How are sales so far, for both games? Out of curiosity, do they sell better on PC or iOS? Oster: Sales are great; we recently made it into the top 10 on iPad with a $14.99 game. There was only on other title over $0.99 in that group and it was Minecraft. We're ecstatic about the success and jazzed at the number of people who are coming out to play one of the greatest western RPGs of all time. As the PC version has been out longer and Baldur's Gate comes from a PC base, we've seen more success so far on that platform, but the Apple sales are building quickly, so it could be a tight race. From our side, we are in this for the long haul; we're working with a great franchise and a strong fan community, so we're looking at this from a long-term viewpoint and we're confident sales will still be strong years down the road. Schreier: It was a little disconcerting to open up the game and immediately see [In-App Purchase] characters, particularly when the game alone costs $15, which is generally considered a high price for this platform. Are you guys not worried about turning people off with this stuff? Oster: Great question, I'm going to go a little ranty on this so, be forewarned: I'm a firm believer in value and I think the $0.99 app period is ending. $0.99 was a price point used by new developers and new franchises to capture users and attention. Eventually $0.99 apps came to dominate the App Store as the race to the bottom hit the logical endpoint. The only way to beat $0.99 apps was to go free, so a number of groups went free, forcing the bottom even lower. To compensate they built apps which are exclusively designed to bleed money out of users using a large bag of tricks. To me this doesn't seem like a good value to the game player. From our perspective, an epic 100+ hours of adventure told in a rich rules system and built upon a great setting is worth a great deal more than $0.99. We put in the in-app purchases as a means for us not to make more money, but to drop the price point for the main game down to the $14.99 price point (the same game on PC is $24.99). With the volume of content between Baldur's Gate II, the included Throne of Bhaal and the new characters and their associated adventures I think we're delivering a huge value for the price, even with all the in-app purchases. I personally have a binary view on pricing: you either want something and you buy it or you don't want it. If you are persuaded to buy something because of a massive discount, you are getting tricked into buying something you perhaps never really wanted. If something is given to you for free just so you can be hooked into a carefully engineered money-extraction pipeline, then you need to be aware of what is happening and act accordingly. I've personally played a number of micro-transaction games over the years and for games I have really enjoyed, I have spent money, more to reward the developers for good work on the game I'm enjoying than anything else. I've also played free games where the paywall rose from the ground and punched me square in the face. When I hit the paywall in an app and realized it is time to start throwing money to make any more progress, I very quickly lose interest. I can think of a half-dozen games I've looked at, played for a bit and abandoned once the pay mechanic reared its ugly head. I actually suffer quite badly from paywall fatigue and as such it becomes a clear abandonment point for me in most free-to-play games. In contrast, the Walking Dead game by the most excellent fellows at Telltale Games has a clear value proposition: you like playing the game, pay some money and get more new content. To me, episodic games are a much better mechanism for a good value proposition. Puff, puff, now I have to catch my breath. Schreier: Last we spoke, you expressed interest in working on a Baldur's Gate 3 if everything worked out with 1 and 2. Is that still possible? What sort of legal hurdles would be involved there? Oster: We're definitely interested in working on Baldur's Gate 3. We've put a ton of work into the franchise and I think the reviews of our new content speak to how well we understand the games. Most reviews say how seamlessly our content fits into the original games. From a legal-hurdles standpoint, we need to get all the right people together in one spot and hammer out an agreement we can all succeed in. We're very happy with our working relationship with Wizards of the Coast and we want to keep that relationship going for a long time into the future. Schreier: Anything else you guys would like to share? Oster: In ending I'd just like to thank the fans of the Baldur's Gate series for their support and give a big shout out to the men and women who did such amazing work on the original games, people such as Scott Greig, James Ohlen, Kevin Martens, David Gaider, Tony DeWall, David Hibblen, Mark Darrah and John Winski. Additionally, Interplay brought in the amazing talents of master craftsmen such as Charles Deenan and Micheal Hoenig. All of these people cooked years of their life into creating some amazing games that have stood the test of time. I'd also like to thank all the great people who interact with us daily on our Baldur's Gate forums. Without your assistance in the beta testing, localization and general feedback we wouldn't be able to make such a great series of games even better. Finally, our team. We've taken the hard road, going back and learning our craft by working with the masterworks of the past, building our skills and growing our capability. Our in-office and remote teams are amazing, gifted people with some of the clearest insight into what makes great RPGs. I am honored to work with such talent and I look to the future as we take those skills we've honed and tackle new and exciting opportunities.